MOSCOW, January 21. /TASS/. The Kremlin has never held any talks on supporting a project by a company belonging to incumbent US President Donald Trump to build a skyscraper in Moscow, Russian Presidential Spokesman Dmitry Peskov said on Monday. "No, the Kremlin did not hold talks with anyone at all about building the tower," the spokesman emphasized. The issue of the skyscraper’s construction in Moscow remains in the US public’s eye since President Trump’s opponents are trying to exploit it to accuse him of perjury. Thus, on Sunday, Trump’s attorney and former NYC mayor Rudolph Giuliani had gone on NBC’s Meet The Press to answer whether Trump’s former representative Michael Cohen had lied when he stated to Congress that the talks on the Trump Tower project ended in January 2016 and not in October-November that year, when the US presidential campaign was in its final stage. The issue surfaced following a disputed article posted on BuzzFeed, which claimed that Trump had allegedly instructed the ex-lawyer to lie about the timeframe of the negotiations for this project. Putin’s spokesman stated both earlier and on Monday that Cohen had, indeed, turned to the Kremlin administration with a request for assistance on the skyscraper construction project in Moscow. His request was sent to the publicly accessible e-mail of the Russian presidential administration. According to Peskov, the Kremlin recommended that those sending this request turn to the representatives of the Russian construction business or take part in the St. Petersburg International Economic Forum to find investors. 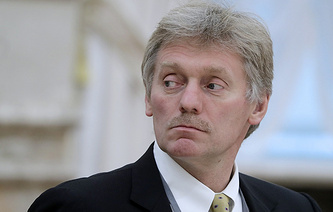 "The Americans themselves and the US president personally are in a better position to judge," Peskov stressed. On the sidelines of the G20 summit in Buenos Aires in December 2018, Peskov even showed journalists several letters from Cohen that had been sent to the publicly accessible e-mail. According to Peskov, the communication between Trump’s representatives and the Kremlin was limited to just these several requests.